When it comes sharing their opinions, kids are can often be more honest than adults. That’s why Check, Please! Bay Area is for the first time becoming Check, Please! Bay Area Kids. 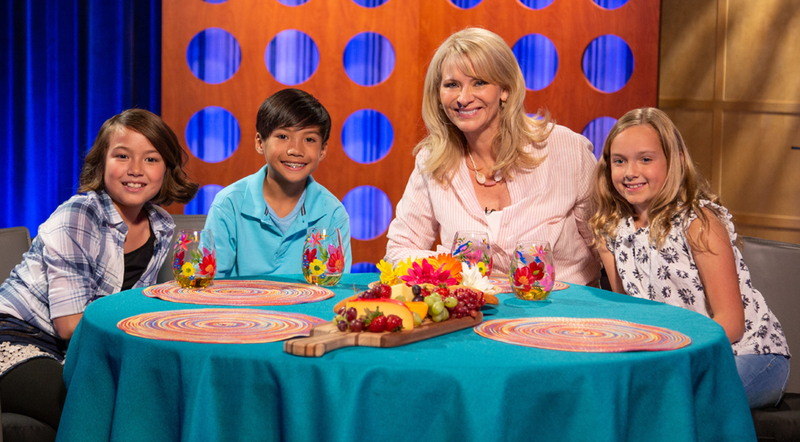 It’s the same show you know and love, but with kids sharing their opinions of each other’s favorite restaurants with host Leslie Sbrocco. Aged ten through 14 years old and hailing from all corners of the Bay, the junior critics dish about what’s good, what’s bad and what’s downright delicious! The four-part special premieres Thursdays at 7:30pm on KQED 9 starting November 29 and continues through December 20. In August, the producers of Check, Please! Bay Area put a call out for submissions asking kids to describe why they would make perfect guests for the show. Within two days, they received nearly 400 applications. Eventually, 12 kids were selected, and their no-holds-barred discussions on everything from vegan meat substitutes to the proper pronunciation for “bibimbap” to the right amount of heat in Indian cuisine, had the production crew in stitches — and soon television audiences as well. The premiere episode on November 29 kicks off with Art’s Cafe, a San Francisco breakfast institution that keeps one young eater craving its signature hash brown sandwiches and Korean bibimbap bowls; the Perle Wine Bar in Oakland’s Montclair Village, which features our ten-year-old guest’s favorite foods — Russian caviar and beef tartare; and Marin Joe’s, popular with Corte Madera locals craving Italian-American comfort food and a jiujitsu-loving kid who has been going there since he was a baby. In later episodes, viewers will visit San Jose’s Minato Japanese Restaurant, where kids meals come with a prize; Tapsilog Bistro, which pairs authentic Filipino flavors with a sporty atmosphere in Campbell; Giorgio’s Pizzeria, where generations of families have been coming for pipin’ hot pizza pies since 1972; Zareen’s Palo Alto, a bustling spot offering contemporary Pakistani and Indian cuisine; the rich frosty shakes at Oakland’s Park Burger; authentic Mexican specialties at San Jose’s Tu Mero Mole; homey Italian fare at Antipastos in San Jose; the Veg Hub, a fast-casual spot offering healthy, hearty vegan dishes in Oakland; and Coco’s Ramen, a cozy Japanese restaurant in San Francisco where you can gorge on both steaming ramen and sushi. Check, Please! Bay Area Kids premieres Thursday, November 29, at 7:30pm on KQED 9. For more information and to watch previous episodes of Check, Please! Bay Area, visit kqed.org/checkplease. Support for Check, Please! Bay Area Kids is provided by Sutter Health CPMC, The Coder School, Oakland International Airport and Redwood Credit Union.